By taking out a troublesome diagonal from the Manhattan grid, the Green Light for Midtown program improved street safety and retail business while creating new public space at one of New York City’s most iconic locations. Pedestrian injuries are down 35 percent and injuries to motorists are down 63 percent, even while traffic is flowing more smoothly than ever. Pedestrian volumes are up 11 percent in Times Square, bringing business to area shops and catapulting Times Square to the second-most expensive retail area in the city. Yet all anyone ever seemed to talk about were the lawn chairs. That particular media obsession may finally be ready for retirement, though. 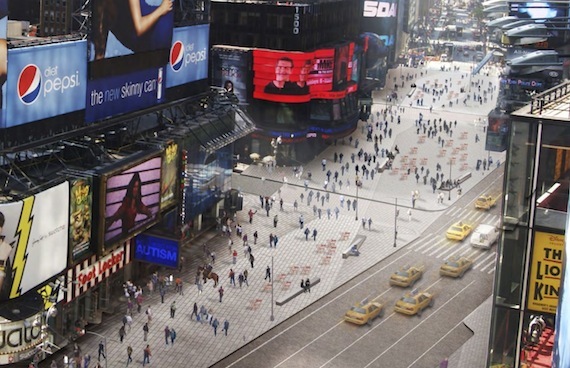 NYC DOT and the Department of Design and Construction released plans for the permanent reconstruction of Times Square last night, as reported by DNAinfo. The entire roadway is going to be rebuilt for the first time in 50 years, said DOT spokesperson Seth Solomonow, repairing the utilities beneath the street. Instead of putting the asphalt back in place, however, the city will be installing a plaza designed for pedestrians from the ground up. The Times Square design, seen from the TKTS booth. Image: NYC DOT. No longer will you have to step down from the sidewalk to the reclaimed street space. The width of Broadway will be laid with concrete pavers in two dark, alternating tones. 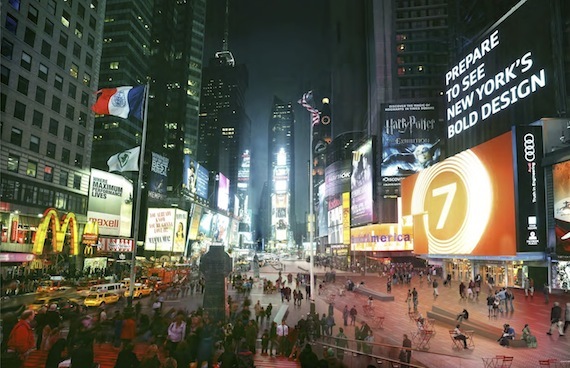 In another touch from architecture firm Snøhetta, which designed the project, stainless steel discs will reflect some of Times Square’s neon back off the ground. Benches will be sited to separate areas meant for lounging from areas meant for walking. 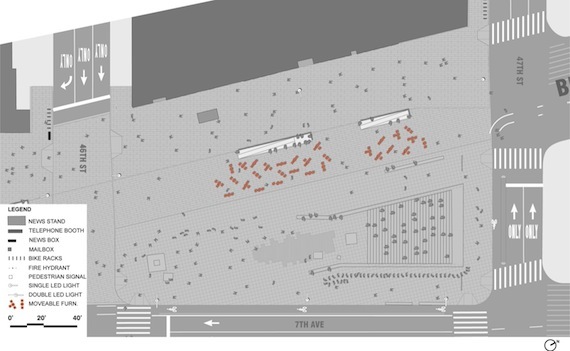 The concrete pavers will extend into the roadbed where crosstown streets interrupt the plaza space. Hopefully, that will send a strong visual message to motorists that they are entering a busy pedestrian space. The new design also includes a bike route through the area, but not on Broadway. According to DNAinfo, cyclists riding south on Broadway’s protected lane would switch to a short contraflow segment on 47th Street, turn onto the west side of Seventh Avenue, cross to the east side of the street at 45th Street, and then cross back onto Broadway at 42nd. For those five blocks, the lane would not be protected. Construction would begin in 2012 and be complete by 2014, according to DNAinfo. As for the bike lane, I hope they can incorporate mountable curbs and put it at a grade in between the street and the sidewalk. Also move the sewer grates out into the street a bit so the bike lanes are puddle-proof. Broadway really should be pedestrianized everywhere it diagonals across the city. It’s a traffic-snarling nightmare. But I suppose that makes too much sense. Steve @thecuozz Cuozzo is going to crap himself when he sees this. It looks like a fine plan. Realistically, though, many cyclists will ride the short way across the plaza rather than follow the unprotected bike lanes. This is really a great improvement. The whole thing has seemed temporary and amateur since the start, but this is phenomenal. @twitter-33954049:disqus I’m optimistic that cyclists will not ride illegally through the plaza. It’s clearly a pedestrian area, and I think the few jerks who might want to intrude on ped space will get frustrated by the crowds. Jeremy, the pedestrian crowds on the bike lane on Broadway are already frustrating enough for me. That’s why I usually ride on 7th Avenue, despite the lack of bike lanes. I think this seems to be an interesting plan. The area seems pretty unprogrammed and flexible, perfect for large group gatherings as well as one-on-one meetings, depending on the furniture layout. I believe is a wise choice for the area, since it is such a confluence of everything. This is the type of free social gathering space that we are seeing more and more of, such as in Union Square, and I like the trend. As for the bike lanes, I think it was a wise choice to keep them away from the ped area, and I doubt many cyclists will try to bike through such a crowded and obviously pedestrian space, especially when there is a clearly marked alternative route. The problem with the old design was that the bike lane ended at 47th St with no guidance for cyclists, until the lane reemerged at 42nd Street. It seems the old design was changed at the last minute to prohibit bike riding through the plazas, and no good alternative was in place. That said, while it’s great and also symbolic to have a decent bike lane go through the area, I’m way more interested in the protected lanes on 8th & 9th aves through midtown, as these will likely be more important links in the city’s network than Broadway. I actually much prefer the existing temporary looking Times Square with red chairs and umbrellas which shows how simple a pedestrian reclamation is over this designer starkitect Times Square. After seeing Trafalgar Square and all the other pedestrian plazas throughout London, I can’t believe anyone would complain about Times Square. Don’t they know that this is what great places in great cities are supposed to be like? the top picture is wrong – they have the plaza on the wrong side of the street (the ABC/Nasdaq side is the car side). the bottom picture is correct. how could the designers make such huge mistake? weird. overall i like the redesign. Sorry Rich – this view is looking from about the POV of the Nasdaq building – Bway used to cross 7th north of 42nd right? So there is plaza space on both sides of the avenue. I like it all. Except the bike lane stuff. I’m ready to give up on a Broadway bike lane.Already, in the section between 42nd and 35th St,the oblivious pedestrians spill off the sidewalk into the bike lane and make it unsafe at any speed.However, in the same section, the traffic-calmingefforts have been so successful — reducing totalvehicular traffic and greatly reducing its speed –that the narrowed street now seems invitingly safe for bikes to mix with other traffic.This segment should the model for most of Broadway.Downtown vehicular traffic flow should be interrupted and diverted, the way it is at Times Square and again at 35th St. The street can remain open for deliveries of goods and passengers — allowing both taxies and private cars to get to mid-block doorways — but made useless for thru traffic.This “compromise” effectively removes Broadwayas a north-south route that breaks the street grid, it allows partial pedestrianization, but without ending needed street access along Broadway for the existing mid-block buildings and businesses.Meanwhile, let’s concentrate on pushing for protectedbike lanes up 8th Ave and down 9th Ave, as well as up and down 1st and 2nd Aves. This looks really good. My persistent problem with road closures and pedestrian reclamations is that if the physical layout still has a raised sidewalk, it indicates that the pedestrian orientation is not permanent. I’ll then walk on the sidewalk and avoid the roadway, unless the sidewalk is very narrow (I walk on the roadway on non-pedestrianized streets in Providence at night when car traffic is light) or there are many people walking in the roadway. It’s not how your stereotypical piazza is done. As for London… let’s just say that Central London’s street design makes Iris Weinshall look like James Howard Kunstler. It has beg buttons, fenced medians, fenced sidewalks, Z-crossings, and road crossings that require two separate stoplight cycles. It’s nice that it has some narrow streets and pedestrian plazas, but the major streets are hell. It’s as if I stepped into the sadistic fantasy of a road engineer. This looks like something straight out of 1960s / 70s Urban Renewal handbook. Where are the trees? It looks like a huge parking lot! It should have a park feel! Kenx, there’s no room for trees. There’s a subway line underneath all of this, so there’s nowhere for the roots to go. They’d have to be potted plants.